Healthy, sustainable weight loss comes from burning more calories than you eat. When this happens, your body makes up the difference by accessing extra calories you eat earlier and stored fat. The herbs contained in this mix were combined to help jumpstart and support your weight management goals. For this reason, Dieter's tea may be an excellent choice for use on a cyclical basis. Pu'erh tea, with its unique bold and earthy character, is fast becoming very popular all over the world as a health and wellness tea. 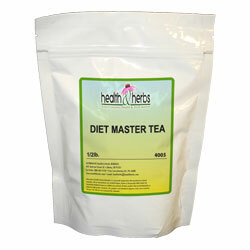 It is commonly regarded as an effective slimming and naturally safe dieter's tea throughout Southeast Asia. The tea has also been used to fight "bad cholesterol", or LDL cholesterol. In one animal study, it was actually shown to raise the level of "good cholesterol", HDL. The microbial aging of Pu'er tea can be as helpful as some meds for lowering blood sugar and preventing diabetes. Although all teas are believed to be capable of lowering blood sugar levels, Pu'erh and Oolong teas are thought to be the most effective. In fact, they sometimes lower blood sugar levels too fast and some people feel weak in the limbs, more rapid heartbeat and even feel dizzy. In ancient medical practice, the tea was used to aid in digestion, specifically beneficial in the spleen and stomach. It is still used today after heavy or high-fat meals as well as after consuming too much alcohol, to help lessen the discomfort of hangovers. There is a new super-beverage in town, and its name is rooibos tea. Although it is not technically a tea, the herbal drink is surging in popularity. The purported benefits range from reducing stress to fighting cancer to making the skin look younger. Rooibos tea comes from a shrub and has very small amounts of many different minerals, and it's calorie-free. That is why many people turn to rooibos tea throughout the day to help suppress their appetite. Rooibos has trace amounts of iron, calcium, potassium, manganese, magnesium, zinc, fluoride, and copper. But, what makes rooibos tea particularly good for your belly is a unique and powerful flavonoid called Aspalathin. Research has shown that this compound can reduce stress hormone that triggers hunger and fat storage and is also linked to hypertension, cardiovascular disease, insulin resistance, metabolic syndrome, and type 2 diabetes. Frequent consumption of Chickweed extracts may help to strengthen all systems in the body and rebuild vitality. It is so highly nourishing, and excellent for those who are recovering from an illness or surgery, those dealing with wasting disease, the anemic and the elderly. Chickweed tinctures alkalinizing properties may benefit those who are trying to lose weight, and has even been called nature's "diet herb." It contains soapy like substances called saponins which help to break down fat cells, sometimes with phenomenal results. Chickweed also nourishes and regulates thyroid function and balances the metabolism. The herb also reduces bloating by helping you lose some of the water weight. Garcinia Cambogia, also known as the Malabar tamarind, is a small sweet tropical fruit. People around the world are chatting it up like it's their new personal trainer. This may be because of the compound called hydroxycitric acid, or HCA. is known to block a portion of an enzyme called citrate lyase, which helps turn sugars and starches into fat. Blocking this enzyme, and carbohydrates can help divert food into energy production rather than accumulating as body fat. HCA also seems to have the ability to help suppress the appetite, but not in the same way as diet pills. Rather, it increases the level of satiety, making it easier to eat less. Bilberry fruit, whole, is a deep, rich purple color. As you might expect, they are full of anthocyanins. And, as it turns out, it may be able to help resolve a constellation of disorders called metabolic syndrome. Metabolic syndrome puts people at risk for heart disease and type 2 diabetes. Signs of metabolic syndrome include obesity, high blood pressure, high blood sugar, and inflammation. Insulin, as you may know, plays a major role in the regulation of blood sugar and in the deposit of fat. Research has found that the anthocyanins in bilberries block the expression of genes that are triggered by high blood sugar levels, and they encourage weight gain. The dried fruit of this plant, related to the blueberry, may provide beneficial effects for weight loss due to its antioxidant properties. Did you know that the bark of the ancient tree, Pau d'Arco not only reduces obesity but also cuts your risk of type 2 diabetes and coronary heart disease? Tabebuia impetiginosa is considered to have antibacterial, antiviral, anti-inflammatory, astringent, antiparasitic, antimicrobial, laxative, analgesic, anti-cancerous and anti-fungal. Now, German scientists have confirmed that the extract of Pau d'Arco inhibits absorption of dietary fat, and very well may reduce obesity and heart disease, as well as diabetes. It has been shown to reduce blood triglycerides in animal studies and may help to fight against serious health problems. Oolong tea is made of the leaves of the Camellia sinensis plant, the same plant as black tea and green tea is made from. Only 2% of the non-herbal tea produced in the world is oolong, which is aged for a longer period of time than green tea, but a shorter period than those of black tea. Ancient Chinese beliefs link Oolong tea consumption to weight loss. Oolong tea is full of potent antioxidants boosts your metabolism but may help to protect the body from chronic disease as well as increase metabolism by 10% or more for up to 2 hours after drinking the beverage. Antioxidants help the body to burn fat more effectively and quickly, especially in the tummy and upper arms. Research has shown it also helps to keep the body fat off once it's gone. Oolong also helps to regulate your blood sugar levels, helping you to feel more satisfied and balanced and may help to stop the craving for sweets. White peony root tea is paeoniflorin, a substance that has an antispastic action in many areas of the body's systems. The active substance that can be found in this tea helps to enhance these effects are flavonoids, proanthocyanidins, and polysaccharides. White Peony root tea has anti-inflammatory, analgesic diuretic and sedative properties. This can be a great help if you suffer from liver malfunction, poor circulation, and high blood pressure. Fenugreek seeds contain active ingredients that serve as an effective nutritional supplement for many health benefits. Fenugreek tincture possesses a powerful ability in aiding the digestive process, and a vital ingredient for diabetics to help regulate the level of sugar in the body. Recently the herb has gained a reputation as a weight loss supplement, and it has become widespread. The truth of it is, it can, because it is rich in polysaccharide known as galactomannan. This component has also been shown to give the feeling of fullness, so that you may want to eat less than you normally do, which helps in the goal to lose weight. You will also need to change your lifestyle a bit, and there is no way out of that. You will also need plenty of exercising every day and, of course, a healthy diet. Senna leaf tea works in two key ways to help you lose weight. First, it stimulates intestinal contractions, and second, it helps to increase fluids and electrolytes in the colon, which softens stools. Therefore, Senna leaf tea is beneficial for helping to relieve occasional constipation and for cleansing the bowels. So, what is it in Dieter's tea? Because the herb helps to bring balance to your lifestyle during your diet. It helps with some of the conditions you face with some weight loss diets, especially those that are low in fiber. Short-term use of Senna leaf may help to eliminate toxins and undigested food in the large intestine. Cleansing and detoxing the bowels may help support nutrient absorption from incoming "new" foods. Making each nutrient count is critical when eating a low-calorie diet and detoxing helps to support optimal metabolism. Uva ursi has many benefits, and in particular, positive effects for those who are looking to lose some weight. The leaves of the plant are popular with herbalists because they contain arbutin, hydroquinone, and other chemicals that defend the body against harmful organisms. Uva-ursi also contains astringent-like tannins that shrink and tighten mucous membranes and also reduces irritation. It neutralizes urine acidity and increases urine flow, which may help to reduce bloating and water retention. This effect has also earned Uva ursi leaf recognition as having potential weight loss benefits. While the weight loss mechanisms require monitoring, as the water weight does not come off easily, supplements like this are highly recommended in the herbal world. Although losing water weight is not a stand-alone measure for losing weight, Uva ursi has a role in an overall weight loss program for its mild diuretic effects. Besides the valuable nutrients that are found in Dandelion, there are also phytochemicals that are responsible for most of the medicinal effects of the herb. Some of these are phytochemicals, taraxinic acid, taraxasterol, beta-sitosterol, caffeic acid, pectin, inulin, and alkaloids. The taraxinic acid, found in the leaves of dandelion, is responsible for its diuretic property as well as some of the detoxifying effects. Other potential benefits include a laxative, digestive aid, appetite stimulant, immunostimulant, and cholagogues to stimulate bile secretions. Dandelion is often used to shed water weight and also to reduce blood pressure. As a diuretic, Dandelion spares potassium, because it contains potassium, and increases the body's storage of the mineral. Dandelion is also a gentle laxative and can be used to improve digestion, liver and gallbladder functions. It may also help to improve the body's lipid profile, by reducing the levels of total cholesterol and triglycerides in the body. Even though Dandelion leaves promote diuresis and can help shed some of the water weight, it is most effective for water weight and edema. The glycosides in Stevia leaf are not metabolized by the body, and so it is a zero-calorie food. And, processed Stevia can be hundreds of times as sweet as sugar. For dieter's, Stevia leaf represents a way to consume sweetened foods without the "empty calories" from sugar. A 2010 study found that those who consumed the herb did not feel more hungry or have more cravings than those who consumed real sugar. But, the Mayo Clinic found that it does not affect blood sugar levels that same way. An article on Stevia reported that it even helps to regulate blood sugar and sometimes reduce cravings. Stevia does not contain any toxic substances and has been proven to be a safe and healthy alternative to cane sugar and corn syrup. It may aid the body in losing weight and managing weight by consuming a zero calorie, zero carbohydrate herbal supplement in place all that sugar we use. Boost your metabolism with the natural mix of Pu'erh Tea, Green Rooibos Tea, Chickweed leaf, Garcinia Cambogia 70% HCA, Bilberry Whole, Pau D' Arco Bark, Oolong Tea, White Peony Tea, Fenugreek Seed, Senna Leaf, Uva Ursi, Dandelion leaf, Stevia leaf. Instructions: Add 1/4 cup of the tea into 2 quarts of boiling water, take it off the burner and cover the pot, stirring occasionally. The tea will be ready in 5 minutes. Refrigerate, drink the tea hot or cold. Drink 2-4 cups per day, preferably before meals.